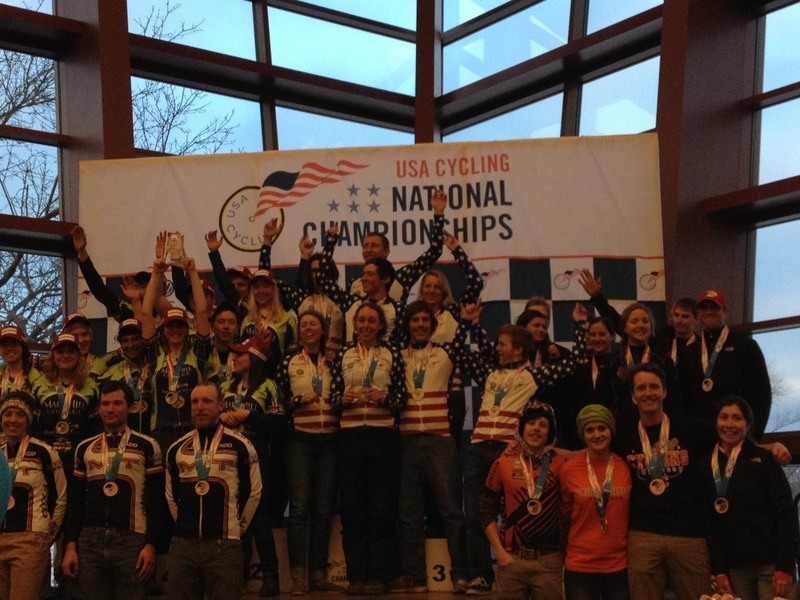 The culmination of our cyclocross season came with USA Cycling’s Cyclocross Nationals last weekend. It’s different than most collegiate national events, since cx nats also features the championship races for the elite men and women, U23 riders, juniors and masters. This year we returned to Verona, WI, and to our amazing hosts from last year, Brian and Carolyn Cassel. The Mars Hill Cycling cyclocross team was Tim Jenkinson, Corey Davis, Chad Capobianco, Tyler Hutchinson, Jake Possinger, Maitland Jones, Allison Arensman, Addy Albershardt, Sarah Felpel, Sarah Huber and myself, Laura Rice. 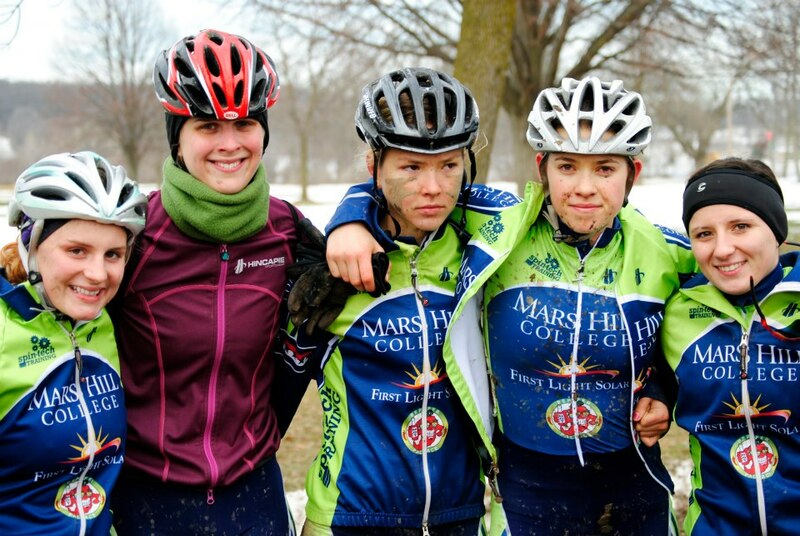 This team is the largest in the history of Mars Hill Cycling to go to cx nats, but we knew the competition was going to be fierce and that everyone was going to have to work hard. Last year the weather in Verona was surprisingly mild, but we knew that our chances of that happening again were very low. After wheeling the short bus across the country, we arrived on Thursday to a couple feet of snow and temperatures in the 30’s. It was exciting to see such different conditions than what we’re used to here in North Carolina, so we quickly prepared to go pre-ride the course. Our hosts live within a mile of Badger Prairie Park, making it easy to ride to and from the course on our bikes. When we got to the course, there were still races in progress, so we ventured out to try some snow riding! Snow riding is harder than it seems, especially when it’s deep! The trick is to find a path that has already been stomped down, and then stay on the very narrow and sometimes slick trail. After a few falls and what is becoming a Mars Hill Cycling tradition of snow ball fights whenever snow is present, we ventured out on the course. The course was very similar to the course from last year. However, the conditions were constantly in flux from one hour to the next, due to the extreme temperatures. Pre-riding really did nothing to prepare us for our actual races since the course condition was so varied from one day to the next. However, it felt great to be riding again, even if it was in thick, peanut butter like mud. Friday we returned to ride the course some more, and also worked on our bikes and equipment to ensure that we were all ready to race! Everyone consulted back and forth about what layers to wear, what to expect while racing, tire pressure and got busy adding toe spikes to shoes. 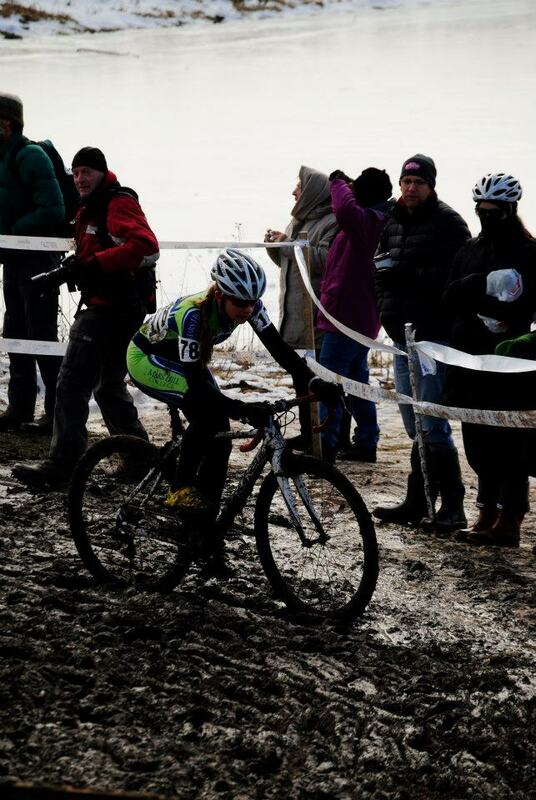 Allison Arensman plows through the mud on her way to the podium. We woke up excited and nervous on Saturday and got ready before heading over to the CycleOps/Saris sponsored warm-up tent. The warm-up tent was an amazing improvement over last year! We settled in to warm-up and mentally focus on racing. Too soon we had to bundle up and head to the cold, cold staging area. Even though we raced at noon, the temperature had been dropping, so it was between 28-30 degrees by the time we were at the start. 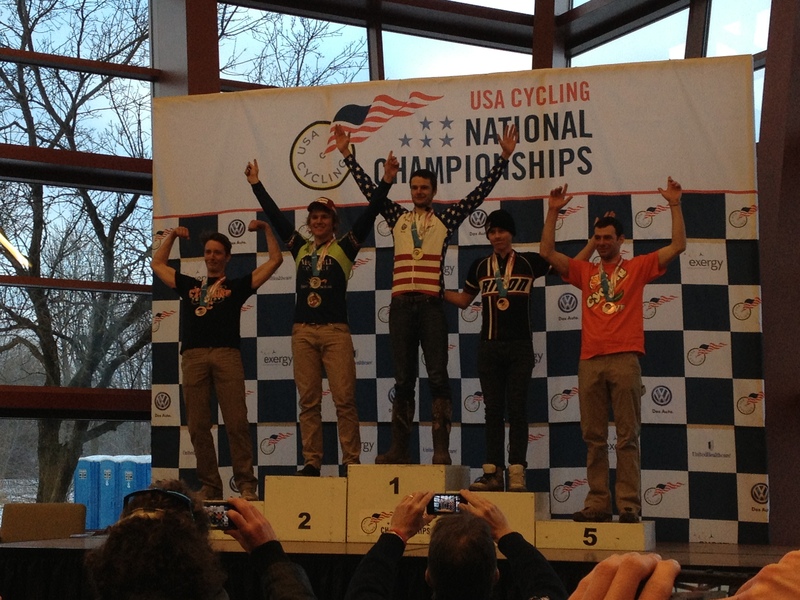 Since I won the SECCC DII Individual Omnium for cyclocoss, I received a call-up to the front-line of the start. I never thought that I would find myself on the first line of the start, but I was excited and proud to be there. Allison, Addy, Sarah F. and Sarah H. followed. Combined we made up about 30% of the women’s DII field! We started a minute behind the DI ladies and began the sprint down the paved section before hitting mud. There was a lot of mud. We all struggled once we hit it since it was so thick. However, Allison and Addy plowed on through and I quickly recovered to get back to the middle of the pack. The conditions of the course in our women’s race were terrible. The mud was so thick in some places that it was smarter and quicker to shoulder the bike and run. Even then, everyone got weighed down with mud. We made several bike switches during the race and the weight difference between the clean bike and the dirty bike was significant. In addition to the mud, there were many sections of the course that were frozen, some covered by a thin layer of mud making it even trickier. However, we all raced hard, and Allison podiumed with 4th place, Addy finished 7th, I finished 9th, Sarah F. got 14th, and Sarah H. ended in 18th. Our team points put us only two points behind Brevard for the team omnium, 279-277. 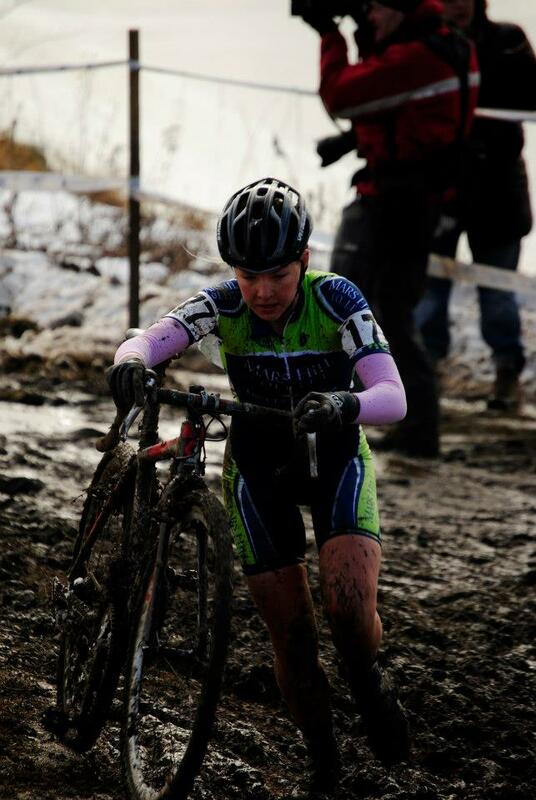 Addy Albershardt enjoying the mud on her way to a top ten result in Verona, WI. Saturday morning we repeated our trip to the course, this time to help our guys as they warmed up and prepared for the race. The temperature at race time was about 12 degrees, and the course was completely frozen. Tim got a great spot on the front line. However, in a weird repeat of last year, he experienced a technical soon after the start, requiring a bike switch in the pits. Corey also started strong, but quickly found out how slick certain sections of the course were, damaging his bike and also requiring a switch. Tim and Corey both continued to ride strong, with Tim moving his way up through top five to second place. Chad, Tyler and Jake all raced smart, working their way through the icy corners and rutted course. Maitland suffered a flat in his first lap, having to carry his bike over half a lap to get to the pit bike. Tim finished with a strong second place. Corey came in 14th, with Chad in 23rd, Tyler in 31st, and Mait in 37th. We all headed back to the house to warm up and prepare to watch the elite races. The men’s race finishes gave us enough points to win top team points over Brevard, 240-236. Combining team points from the men’s and women’s races, we tied with Brevard for first place in the team omnium. However, we lost the tie-breaker because they had a first place in the women’s race compared to Tim’s second in the men’s, which put us on the second step of the podium. Tim Jenkinson repeated his silver performance from last year. The rest of Sunday, we relaxed and watched the elite women and elite men’s race. We cheered on Allison as she raced the U23 Women’s race (within the elite race) and were so excited to see her on the podium in second! We all cheered for Katie Compton, who won her 9th championship and for Georgia Gould who came in 4th. We spread out and went crazy with the other spectators during the elite race when J-Pow rode by and cheered on WNC-area rider Josh Whitmore. Jake got to cheer on his favorite rider, Adam Craig, who rode that much harder! Allison Arensman rode to an impressive 2nd place in the U23 women’s race. After the elite races, we headed to the awards location, where we got our snazzy second place medals and plaque. The SECCC was represented well, with three of the five DII teams coming from the south! 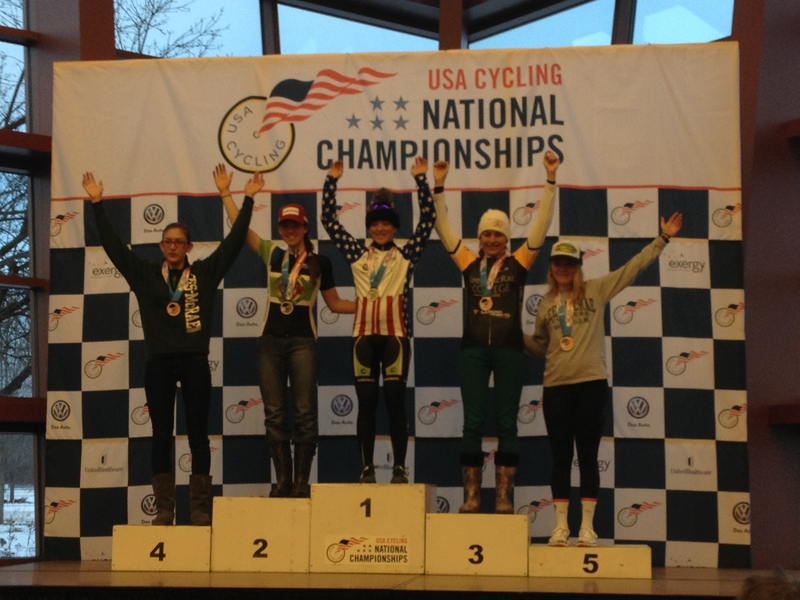 North Carolina made a mark on the awards, with 4 of the 5 U23 female riders being from NC schools (including Allison) which makes it even better that Asheville will host the 2016 USA Cycling Cyclocross Nationals. While getting second was disappointing, it was evident that everyone raced their hardest, from Tim working his way up the field to second and Corey’s determination after wrecking, to Allison recovering from a bad line selection and Addy getting up after each slip in the mud, from Mait carrying his bike from one side of the course to the other to get a pit bike and the Sarahs experiencing the most extreme race conditions yet. I’m so proud to be a part of a team that works so hard! It’s bittersweet that I won’t be joining them for next year’s cx nats, since I’ll be graduating in May. However, I’m glad for the opportunity to ride my heart out, be inspired by my teammates and pro riders alike, and make the most of the rest of our 2012-13 season! After being tied on points with friendly SECCC rival Brevard, we settled for 2nd in the team omnium due to a tiebreaker. Couldn’t have been closer! Huge thanks to all our sponsors who helped get us to nationals this year! A special shout out to Go Soap, which saved our kits from the mud! To ProGold who kept our bikes lubed in the pits. To Beer City Bicycles in Asheville for just about everything. Thanks to Coach Hugh Moran for getting us there and being a great coach. Thank you also to Todd Arensman who supported us with equipment, bikes and encouragement! Thank you to the Cassels for welcoming us into your home for several days! Thank you to Drew and Industry 9 for the loaner wheels and the pit support!